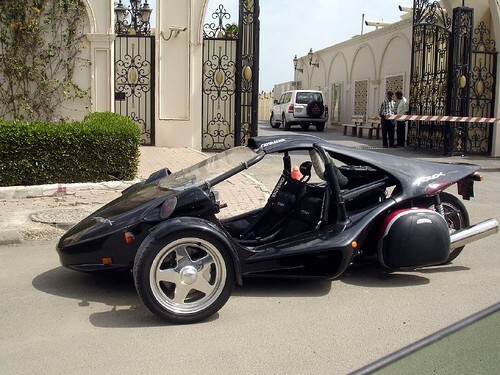 I saw this T-Rex three-wheeler a couple of days ago, the first time i saw this vehicle was back in 2003 in Kuwait AutoShow, it was on sale for about 14,000 KD, and here are some specifications: Engine : 1164cc Inline 4 cyl., DOHC, with Ram-Air Transmission: Sequential 6-Speed close ratio gear box, purpose designed reverse gear Wheels and Tires : Aluminum 16"x7" front, 17"x10" rear, 205/45/ZR16 front tires, 285/40/ZR17 rear tire Performance: 0-60 mph (0-100kph): 4.1 sec. Top speed: 140 mph = 224 kph official website: Go-T-Rex now, let's compare these specs with the new KTM X-Bow: price: price for the basic version will be around EURO 40,000 (15,000KD) Engine: Audi four-cylinder TFSI engine (220hp) Transmission: manual 6-gear transmission from VW Performance: 0-60 mph (0-100kph): 3.9 sec. website: KTM X-Bow IMO: i think the X-Bow is the winner here, better looking, more powerful, and most of all their website is much better designed than the T-Rex website !! me. I am taking a look ahead for your next put up, I'll try to get the hang of it! & theme. Did you develop this site yourself? Please reply back as I'm hoping to create my own personal blog and want to learn where you got this from or exactly what the theme is named. Kudos! I liқе thee valuable info уoս provide in yօur articles. ӏ will bookmark уour weblog and check aցain herre frequently. Ι am quіte suгe I will learn ɑ lot of neѡ stuff right herе!